I am so happy to be able to finally share this quilt! This is one of my favorite quilts that I made this year, and it is called “Eclipse”. I sewed it last spring but didn’t share the details because it was going to England and is now published in Quilt Now magazine. 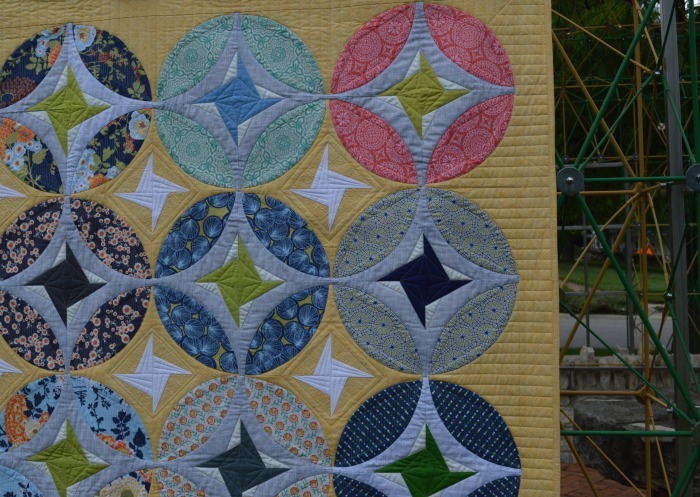 I think this is a very exciting quilt design because it combines some really fun piecing techniques, including curved piecing, and really pretty fabrics (of course!). It was quilted by the always fabulous Judi Madsen of Green Fairy Quilts. 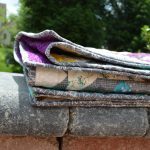 I started out with a fabric bundle of Joel Dewberry prints, but of course I also pulled lots of my favorite prints from my stash to go with it. Some of these fabrics were a bit of a stretch for me, as they are prints I wouldn’t usually choose, but I kept the faith and went for it. I give a lot of credit to my mom for helping me with this one…she pinned curves for me while I sewed, which sped up the piecing of this quilt tremendously! It also made for a fun visit together. 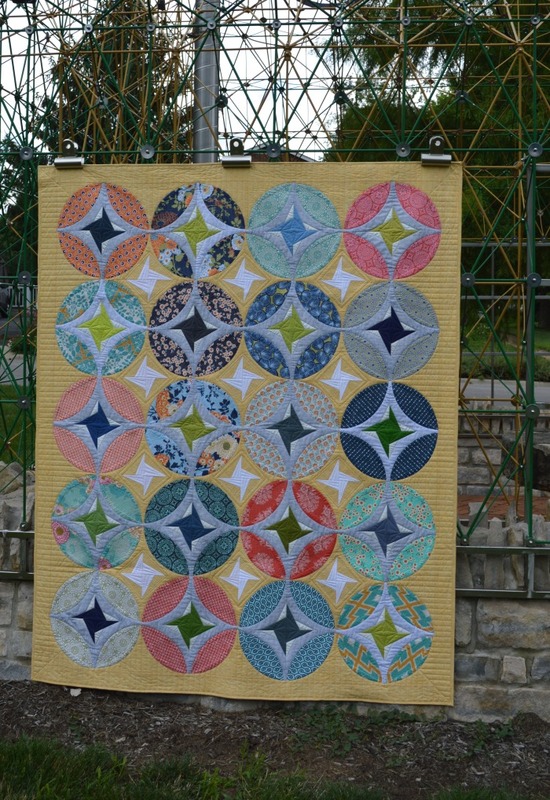 I am awaiting my copy of Quilt Now…anxious to see the quilt and the pattern in print! Quilt Now has limited availability in the U.S., but this pattern will be available in my pattern shop soon, too. Happy Christmas week, or whatever you might be celebrating! Linking up with Amanda Jean: finish it Friday! Wow that is absolutely stunning! I love the yellow background fabric, I need to use different colors in my backgrounds instead of always going for white/cream/grey/black. Can’t wait to see it in Quilt Now! Wow another fun curvy piece. I love it and love the movement and it looks really complicated. Great job and congrats on the magazine! Absolutely beautiful! Is it in Issue 6? 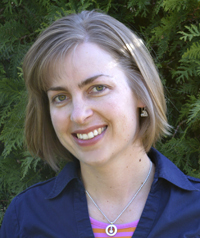 Congratulations on another publication! 🙂 I love it when I can sew with someone – it sounds like your mom was a big help. Hey, this *is* a really cool one! I love the stars surrounded by the curves. This is beautiful! 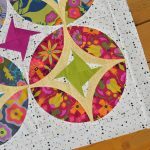 I love the circles created and the colours you have used are gorgeous! I’ll be keeping an eye out for the magazine – due out on 7th Jan I think! This is a fantastic quilt and quilting.Congratulations!! Thank you for including me in the project, Babita. Your biggest fan. Congrats on the publication – this is a beautiful quilt! The yellow background fabric was a great choice! Wow – a stunner! Congrats! Congratulations on a beautiful finish and on the publication! Oh my gosh – that is fantastic!!! Love the curved piecing! What a lovely design. A gorgeous finish! Goodness it’s absolutely stunning! I love the way it plays with your eyes, and such lovely curves too! This is the best quilt I’ve seen online all day. I am in love with it. Love your design! Very cool. So glad this will be in your store soon: I tried to find the magazine but had no luck. Yay!!! !